It’s not just the culture and history, or the golf courses that are interesting and diverse our region. It also boasts a plethora of accommodation options to suit every style and every budget. From intimate boutique hotels and chambres d’hotes, (B&Bs), to luxury 5-star hotels and traditional chateau accommodation set among the vines, you can be sure to find a room you’ll love. For a truly local experience, try our very own fully furnished apartments in Bordeaux, offering a home away from home. Some of our golf course partners, including Golf du Médoc, Grand Saint-Emilionnais Golf Club, Golf Chateau des Vigiers, and Golf de Chiberta, all offer accommodation on or near their courses, meaning you can benefit from this close proximity at tee time. 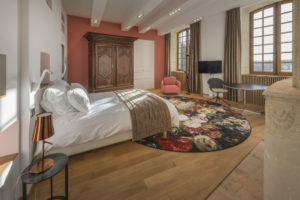 For visitors looking for some extra luxury during their stay, we can recommend the 5-star L’hôtel du Palais in Biarritz, the Grand Hôtel in the heart of Bordeaux – home also to a Gordon Ramsay restaurant – and Les Sources de Caudalie – set among Château Smith Haut Lafitte’s Grand Cru Classé vines of the Graves appellation south of the city. These hotels combine elegance and luxury with fine food and wonderful wine. 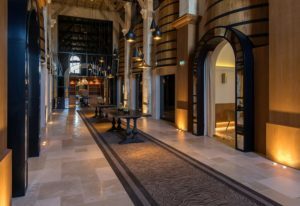 With the Hotel Chais Monnet in Cognac, a new luxury 5-star hotel opened this autumn, we can now claim we are now one of the best ultra-luxury destinations in Europe. Just to let you know, that from 2019 we are delighted to include the Cognac region in our offers. Watch this space. 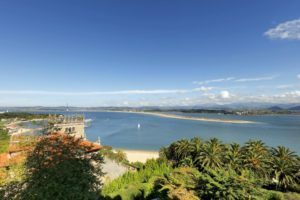 In Northern Spain, if you fancy playing at the golf course (Real Golf de Pedreña) where Severiano Ballesteros learned his trade, we recommend you stay at Hotel Real in Santander city, over-looking the bay just across from this beautiful golf course. There are so many stylish and chic options in Southwest France and Northern Spain. Just let us know where you want to go, and we will gladly give you the best advice. We also love hunting for new hotels. The new Radisson Bordeaux, 4-star, is one of the latest additions to the Bordeaux offer. 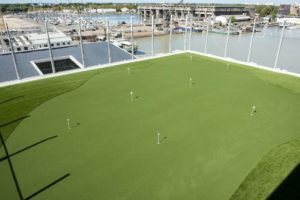 With a putting green on the rooftop overlooking the entire city and the magnificent Cité du Vin, it’s now one of our favourites for golf and wine lovers. 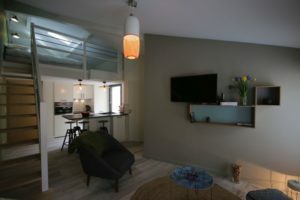 Or, for a full chateau experience, why not try the guest rooms at Château du Tertre or Château Giscours in the Médoc, Château Troplong-Mondot or Château Prieuré-Marquet in Saint-Emilion or Hotel Marques de Riscal or Hotel Viura in La Rioja ? 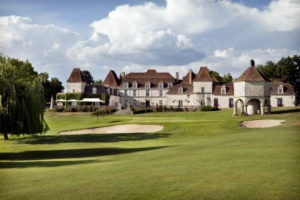 Château life at Prieuré Marquet. A perfect example of many quaint rooms in châteaux selected by Green&Grapes. When you join Greens & Grapes for a holiday, you benefit from our local knowledge and experience. We know every accommodation owner, and we have inspected every hotel and apartment. We offer our guests the most competitive prices – negotiated locally with our partners – and all our packages include breakfast.